As WordPress changes in 2019, I will keep this page updated of those changes so you can get the most out of the book. The 2020 version of this book will be updated to include the following updates, plus any new material. To make it easier to use this page as it grows in length, I've created a table of contents of the updates. 1. Install WordPress using HTTPS instead of HTTP. 2. YARPP has been discontinued. In the book, I show you how to install WordPress using HTTP. This is an insecure protocol and although a lot of sites still use it, using HTTPS is a much better idea going forward. The next version of the book will include details of setting up with HTTPS instead of HTTP, but for readers of the current version, here is a video showing the process. This video was taken from my WordPress for Beginners course. Thanks Alan Heckman for the heads up on this. Typical that only days after publishing the book, a plugin has disappeared. The YARPP plugin is one that I have used for many years, so it is sad to see it go. Fortunately there are a wealth of alternatives. I have been testing a large number of related post plugins this morning. I wanted to recommend one that was simple to use, automatically adds related posts, but offers the flexibility for those that use Page Builder plugins. It was a difficult task. I recommend that you actually try out a few yourself to see which one best suites your site and setup. The one I usually fall back on if YARPP didn't behave is called Contextual Related Posts, but that one was not working on my test site using Elementor Page Builder. 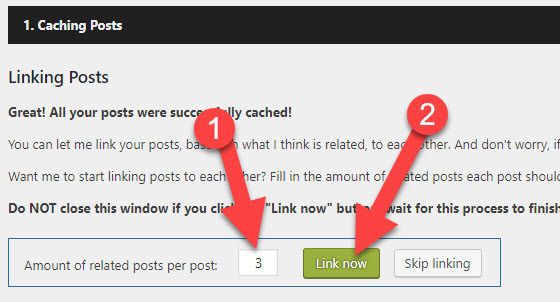 If you want a fully fledged related posts plugin, I do recommend you try that one. You can find it by searching the repository for Related Posts for WordPress. Once installed and activated, it's easy enough to set up. Select the number of related posts you want, then click the Link Now button. In the Settings menu in the left sidebar, you now have a Related Posts item. Go there to configure the output of the plugin. At the top of the settings, I recommend you check the cache option. You can pretty much leave all of the other options and check your posts. Does the related posts section show up? If so, then go back and look at the settings to see if you want to tweak the output. Towards the bottom of the settings are the Thumbnail Settings. You can specify whether you want thumbnail images next to the related post entries, or just text. If you want just text, then scroll even further down to the Styles section and select Text Only. For those that want to look at the new theme, there is an introduction to the theme here. There are more details about this theme here. This plugin was closed on October 23, 2018 and is no longer available for download. Thanks for the heads up. Typical that this happened 4 days after the book was published. I am now looking for an alternative and will provide details above when I have one. You never mention Jetpack. Seems useful to me, plus coded by the people who do WordPress. I know it’s controversial. What are your thoughts? too much stuff included that I wouldn’t use. Andy, I recently bought your WordPress for Beginners and am setting up my web site using your directions. Just installed and Activated Contact Form 7 and following the steps, have copied the shortcode and trying to create the contact page, however there is no shortcode icon in the toolbar. Can you advise? Just paste the shortcode into the editor. I saw that but haven’t looked at it yet. I faced an issue while activating a plugin, searching in plugin support forum revealed that the plugin required a newer version of php, whereas stablehost run php 5.3 by default. It might be a good idea to add some info about php version compatibility in the book. Some years ago I sweated blood and built a simple website using Moonfruit. Now we have just paid a professional to rebuild our site using WordPress. She uses Divi to make posts. There are tutorials on elegantthemes.com. Do you have any comments or updates on Divi? Enjoying your book so far. I think Divi locks you in because of the way it builds pages. Try switching to another theme in the future, and everything will be a mess, with some content possibly disappearing. Maybe a Divi user can tell me if i am wrong. I deleted my old site that I had started using Divi on. I reinstalled it for reference purposes and used whatever was the default theme, as I am not planning to send any traffic there. The posts that I built with Divi have code language on top that looks like this: [et_pb_section fb_built=”1? _builder_version=”3.0.47? ][et_pb_row _builder_version=”3.2.2? background_size=”initial” background_position=”top_left” background_repeat=”repeat” custom_padding=”27px|0px|27px|0px|false|false”][et_pb_column type=”4_4? _builder_version=”3.0.47? parallax=”off” parallax_method=”on”][et_pb_text _builder_version=”3.2.2?]. And another line at the bottom. The posts I built without Divi look fine. Were I to have a large Divi built site and transfer it out to another theme, I assume it would be time consuming to fix. This was my understanding. Thanks for the info Eva. Some plugins are requiring a word press dot com account to activate; if I choose not to do this what affect if any will I experience as I continue with wp4b? Something like that will have no effect on your use of WordPress as taught in the book. However, none of the plugins I recommend require a .com account. Tell me if I am wrong Anne. Stablehost is offering Let’s Encrypt SSL certificates, I would recommend to add the steps to enable SSL certificate in your book, its an advanced level thing but doing it is just 2 simple steps. I used http address of my site during development and Chrome was showing the site as “Not Secure” thus I had to find how to make it secure, it came out to be free and just 5min job but now I have to change http to https address everywhere thus it would have been nice to know it while setting up the hosting. As per the recommendation in your book, I googled for RSS submission, 10 years ago it was different but now it looks like a lost cause, RSS submission sites were mostly broken with Web 1.0 looks, I spent several hours but invain, can you plz guide if I am not able to find the right sites, else I would recommed to remove this recommendation from your book as it will waste time and looks like a security hazart, considering the situation of these sites. Are you saying you cannot find an RSS feed submission site that works? I checked 50+ sites and could only find 10 working and most of these didn’t look famous as their interface was very old, so do you think RSS feed submission is still good for SEO? It hasn’t been good for “SEO” for a long time. That’s not the point of RSS feed submissions. The idea is to help you get your content spidered quicker and therefore in the search engines. Would it be a good idea to show a portfolio of websites, which have been developed using your book? I had completed reading your book last month and my website is almost ready for the public, I can offer to add my website in that portfolio so that others can see how your book can help in building good websites. That is a great idea. Send me a link to your site (contact form on site) and when I get it I will set something up. 1. In permalinks, there are new items under optional after the “tag base”. Should I just leave the default settings (product-category and product-tag and empty box) for the next 3 boxes or would you suggest a change? 2. There is also a new option called “Product Permalinks”. Default is custom base checked with “/product/” in the box. Ok or do you have a suggestion? The settings you describe are not in the core WordPress. They will have been added by a plugin that you are using. Maybe an eCommerce plugin? ?